Trump has banned Muslim refugees. These numbers prove it. One of President Donald Trump’s most controversial campaign promises was to enact a “total and complete shutdown” of Muslims entering the United States. Despite a slew of legal challenges, including a case that's being heard Wednesday by the Supreme Court, it’s clear that he’s delivering on his pledge, at least when it comes to keeping out Muslim refugees. 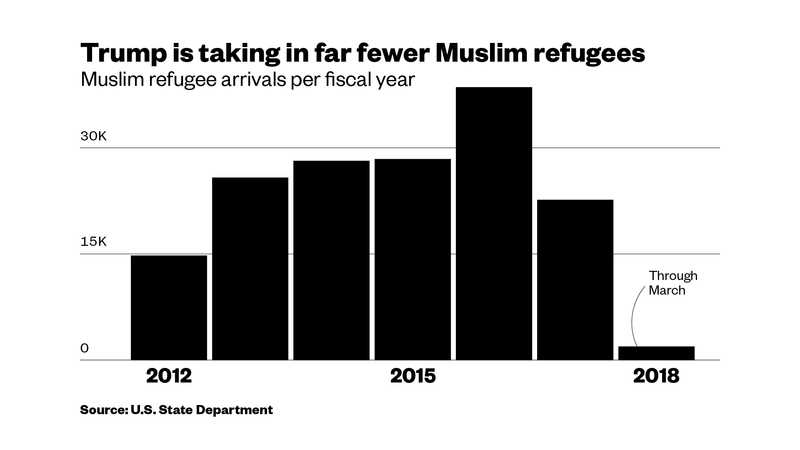 The latest data from the State Department, which oversees the U.S. refugee program, shows that 1,891 Muslim refugees have been allowed to enter the country so far in the 2018 fiscal year. That’s a 90 percent drop from the same period last year, when the U.S. admitted 18,342 Muslim refugees. The numbers are especially dramatic when it comes to Syria, where more than 5 million people have fled horrific violence in a civil war that recently entered its eighth year. 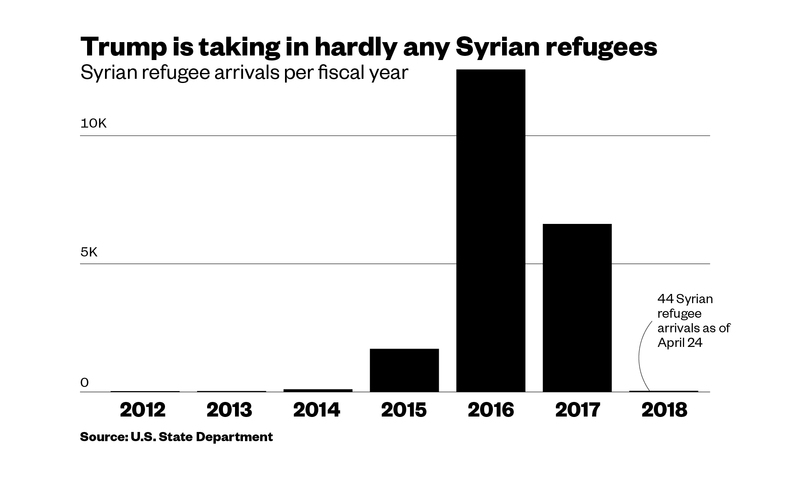 Just 44 Syrian refugees have been resettled in the U.S. in the first six months of the fiscal year — compared to 5,839 over the same period last year. Of those 44 Syrians, only 27 identified themselves as Muslim. The trend coincides with an overall gutting of the U.S. refugee resettlement program by the Trump administration, resettlement experts say. The White House has near-total authority to limit the flow of refugees into the country, and the administration has set a cap of 45,000 for the current fiscal year. 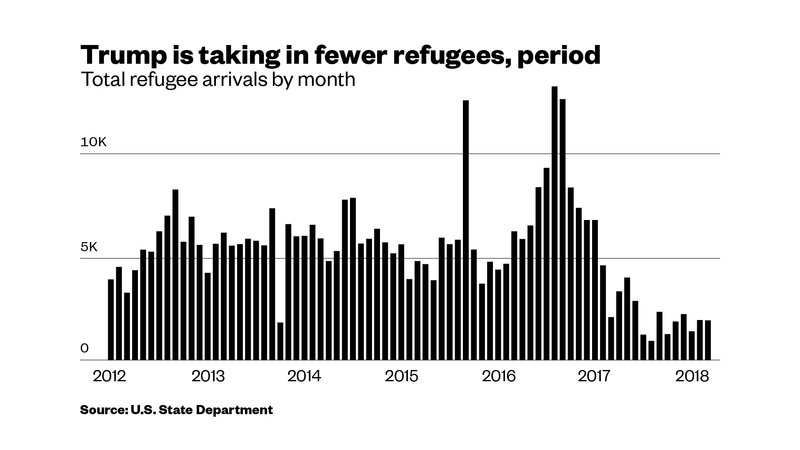 That ceiling was already going to be the lowest in recent history, but so far the U.S. is only on pace to admit 23,000 refugees, which would be the lowest total since the modern U.S. refugee program was established in 1980. A State Department spokesperson said it’s “too early to determine” how many total refugees will be resettled in the U.S. in the 2018 fiscal year, and noted that the U.S. has provided “nearly $7.7 billion in humanitarian assistance” for displaced Syrians. Refugee resettlement experts weren't nearly as generous in their appraisal of Trump’s refugee resettlement efforts, and say the data paints a remarkably clear picture. On Wednesday, the Supreme Court will hear arguments in Trump v. Hawaii, the legal challenge to the travel ban that dates back to Trump’s first week in office. The first iteration of the ban targeted six Muslim-majority countries — Iran, Syria, Somalia, Sudan, Libya, and Yemen — and halted all refugee resettlement. Trump claimed it was not a "Muslim ban," but the state of Hawaii and others sued, claiming it was discriminatory. Trump twice fine-tuned and re-issued the ban after suffering losses in lower courts, and the justices allowed the latest version to stand while the court decides whether it’s constitutional. Read: “Why haven't you come for me?” A family torn apart by Trump’s travel ban. The International Refugee Assistance Project is among the groups that have sued Trump, but Fisher said even if the Supreme Court were to strike down the ban, it wouldn’t necessarily stop Trump from continuing to choke off the flow of refugees. Such a ruling could impact future litigation, she said, but current law gives the president such broad discretion over refugee resettlement that it would require an act of a Congress to change the rules. “A decision that strikes down the travel ban could strengthen the claim that refugee restrictions are also discriminatory and call into question efforts to limit immigration and Muslim immigration specifically,” Fisher said, noting that her organization has sought documents on the Trump’s “decision making process” on refugees through a separate lawsuit in California. Trump's administration has introduced new vetting measures of foreigners entering the U.S., but they've been thin on specifics on what that actually looks like. Several people familiar with the refugee resettlement program told VICE News that the administration has required more stringent screening for refugees — who already faced up to three years of rigorous vetting — while simultaneously devoting fewer resources to performing the newly required checks. Ash and others specifically singled out a vetting procedure called the Security Advisory Opinion or SAO. Previously, SAOs were only required for certain nationalities and age groups, but it’s now mandatory for all refugees from 11 countries, mostly Muslim-majority nations in the Middle East and Africa. Four sources in the refugee community said SAOs simply aren’t being conducted in a timely manner, which has caused clogged the system. At the same time, the administration has also drastically cut back on the number of “circuit rides,” where immigration officials travel abroad to conduct in-person interviews to determine whether refugees are eligible for resettlement. That means fewer people are being allowed into the resettlement “pipeline,” which could reduce the number of refugees who are eligible to come to the U.S. for years to come. The Department of Homeland Security did not provide responses to questions from VICE News about the refugee vetting process. A State Department spokesperson acknowledged the slowdown. “Processing time may be slower as we implement additional security vetting procedures; each refugee's case is different,” the spokesperson said. “The United States continues to resettle vulnerable people who are fleeing persecution and conflict while upholding the safety and security of the American people,” the spokesperson said. The administration has also axed or scaled back pathways to refugee status. In November, the White House canceled the Central American Minors program, which had allowed young people from violence-plagued countries such as El Salvador and Honduras to apply for protection without trekking to the U.S.-Mexico border and claiming asylum. The move closed the cases of 3,800 children. Even Muslims who helped the U.S. military wage war in Iraq and Afghanistan have not been spared from the Trump administration’s refugee crackdown. These Iraqis and Afghans helped U.S. forces with translation and reconnaissance, and as a result they are especially vulnerable to retaliation in their home countries. Even though Iraqis are eligible for a special program, State Department data shows only 106 have been resettled so far this fiscal year. With a backlog of more than 58,000 cases, the International Refugee Assistance Project estimates that at the current rate it would take more than 200 years for an Iraqi applying today to be resettled. “Refugees will ask, ‘What did we do?’ We have to explain, ‘You didn’t do anything. We’re the ones who have changed, our country has changed and we’re not offer protection the way we used to,’” said Melanie Nezer, senior vice president of public affairs at the refugee resettlement agency HIAS. Correction (April 25, 12:07 p.m.): An earlier version of this story misstated the total number of Muslim refugees allowed into the U.S. so far in the 2018 fiscal year. The total is 1,891, not 1,257. The charts in this story have also been updated.